05-2016 'The Great Leveller' joins The Donna Spaan Contemporary Collection of Art. Notes to artist from Donna Span, Donor. The Donna Spaan Contemporary Collection of Art, Calvin College, USA. May 2016. - The work is “strikingly beautiful.” This is a phrase one does not often use when thinking about mortality and death. But while “The Great Leveller” is home to death, the work is not exclusively about death; rather it is also about imbuing a stark “levelling” reality with hope and promise. Death so framed becomes heightened—made trenchant through beauty’s grace. - The work engages its subject matter dialectically/paradoxically: that is, there is constant conversation resonating among the visuals. They launch thoughts about growth and decay, suffering and loss, beauty and repugnance, pain and redemption, the past and the present, time and eternity. This colloquy makes for a metaphysical work—one that houses a rich worldview. It also offers viewers a slice of poetry. An icon. - Much of the meaning, weight, and density of the artwork come through careful attention to craftsmanship, beauty of form, and the use of symbols: water become both nourisher and resting place; a human skull bathed in white light lying at almost dead center of the visuals; a white and a red flower past their prime, alive in the same dynamic light; green stems holding up these flowers as they levitate. Two plants in different cycles of living and dying, each with resurrection seeds at their core. And the blue upward climbing butterfly—offering hints of a soul or a spirit leaving an implied body. This is life and death on one tether, and running as companions together. 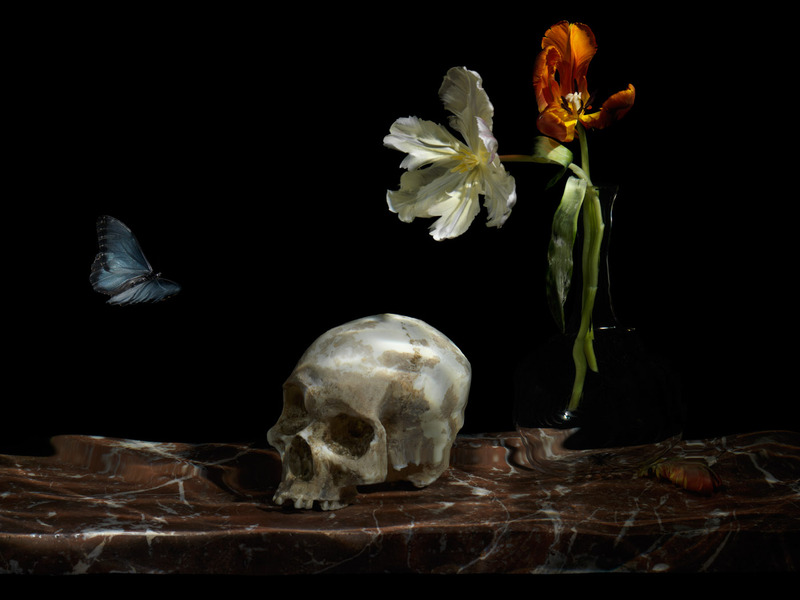 Life inside a Vanitas still life. - Central to the work’s great achievements is the Presence of a pure white light—akin to the title of my art collection—“Light: An Eternal Presence.” This is mystical light alive in the midst of difficult realities and winter darkness. It is also the Light of illumination and benediction. - Looking at the image again I am reminded of other artists: words found in Russian writers, the sonnets of John Donne, and sounds from the music of John Tavener. The Great Leveller sits in fine company. It is a Vanitas in contemporary dress captured through the lens of a camera.